Hi friends. Have you seen these coloring books yet? Well they are all the rage right now, and they are so much fun to color. They have exciting designs on every page and different themes to choose from. You can use crayons or colored pencils to color in the pages and they are a great way to relieve stress, and perfect for teens and adults. This is a way to bring out your imagination, creativeness, and get lost in coloring for hours. I bought a few of these online from Amazon and they are also sold in bookstores such as Barnes & Noble, and at Costco. There are so some many different design books to choose from such as flowers, mandalas, animals, etc. I spent some time coloring a page with colored pencils and I really enjoyed it, as I haven't colored in a long time. If you think you might like coloring, than I would recommend these coloring books. These also make great gifts for birthday's or for the holiday's. I just bought my niece last weekend, for her birthday, one of these books and a big set of crayons and markers to go with it. My niece seemed excited to try it out and I hope she has fun. Have you tried out these coloring books yet? I also downloaded an app on my iPad for coloring called Colorfy that was recommended by my blog buddy Jess from Plucky's Second Thought. This is a fun way to color too but you have to get used to using it. You can color some awesome pictures this way. Wishing you all a colorful weekend. See you all next week for Monday's Cooking and Crafting with J & J Link Up! Book Musing Monday at Mary-andering Creatively. Read with Me at Mama Mummy Mum. Book Nook at Create With Joy. I have one that I purchased at Books a Million. I may have to get more. They are very fun and relaxing!! I think they are wonderful! I haven't tried any adults one but am quite involved working (drawing and painting that is) with my kids. I would love to try it and to be honest - have been eyeing Alisa Burke's sets of coloring books. Maybe I just treat myself one of these days. 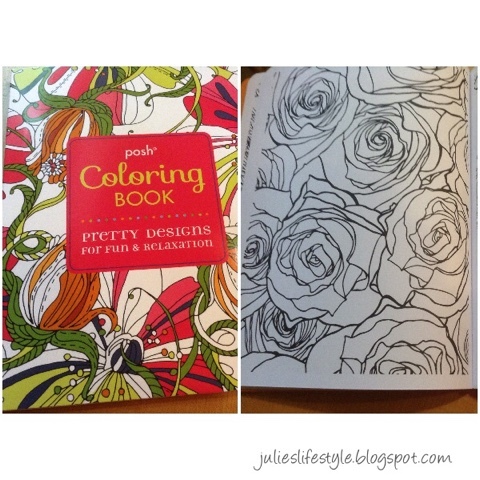 Ooooh, what a pretty coloring book! To be honest I have not seen them so thanks for mentioning them :) Happy hugs to you! That's so pretty. I like that it's geared for young and older adults. You can never be too old to color! :) Thank you also for the warm welcome! Have a lovely weekend! I haven't tried them yet, but my teenager loves them. We just bought her a new one at Michaels, and I was tempted to buy one for me, too. It does look like fun. I saw some at michaels last week and thought they looked interesting and fun too! Great way to get lost in something for a while ;). My family loves these and they do make a wonderful gift! I used to love to color. When my granddaughter was old enough we would sit for hours coloring. I have seen these and I am going to get a couple. thanks for reminding me about them. Coloring was a passion of my growing up! I have seen these types of books and I must try them out to get my zen!!! I have seen the books online, but haven't tried them. They look enjoyable! I love these too. Thanks so much for linking up at Literacy Musing Mondays. I am going to put one on my Christmas wish list. I've recently got into coloring too and love it! Visiting from the Literacy Musing Mondays link up! I've seen these books around for a while now. I always did love colouring in. It's good for your eye muscles too! Colouring can indeed be very theraputic! I recently bought a colouring book and some coloured pencils and I can't wait to give it a try. I used to love colouring so I'm sure I'll find it very therapeutic. The book you show looks lovely - I like those roses! Thank you for sharing with us at the Hearth and Soul Hop, Julie. I had not heard of these until this week Julie. I love the idea of them. I use to doodle with the children's, I want one!! Hi, thanks for sharing at Literacy Musing Mondays. You had the most clicks this week so you are our featured post. The linkup goes live at 6 p.m. Eastern time on Sunday. I'm really enjoying the coloring books that I'm reviewing right now. I had forgotten how much I enjoyed coloring. Thanks for sharing your post at the #AnythingGoes Link Party.